The following letter, written in 2008 by young members of FRSO/OSCL, is an attempt to bridge the generation gap on the question of organization. In our years of work in mass movements and Left organizations, we have found that the questions, and the challenges, posed by young people are quite different from those of our movement elders. This letter is written as a supplement to Which Way Is Left? in the hopes that it will encourage more young people to participate in the conversation on organization and what we need to build a revolutionary movement. Please read it, distribute it, and let us know what you think of it by leaving a comment or emailing us. A Struggle Paper. That’s what our elders in the movement would have called what you are about to read. But not a lot of young folks use the words “Struggle Paper,” so consider this a love letter. It’s a poignant prod at the sectarians and a come hither nod at the independents. It’s a potluck discussion and a midnight session, and if we could play something hot in the background while you read this, we would. It’s a challenge, because we love you, to think about what it’s going to take to actually start building a revolutionary movement in the belly of the baddest beast this Earth has seen. We’ve got some thoughts about ORGANIZATION, and we want to know what y’all think. For the sake of transparency, we are young leaders in Freedom Road Socialist Organization/Organización Socialista del Camino para la Libertad, a revolutionary organization with members throughout the United States. 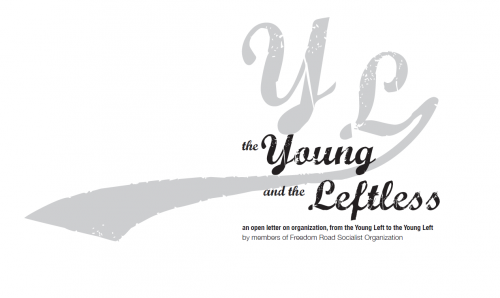 But more importantly, we are you…the Young and Left. We claim ancestors and homelands from all over the globe, genders from across the spectrum, and, well, let’s just say our sexual identities are diverse and open for suggestions. Some of us grew up poor and know what it means to struggle; others never knew hunger but have a bad taste in our mouths from all the inhumanity of this system. We’re from the cities, the suburbs, and the country; from the cold and rainy to the hot and sunny. We are young and Left and frustrated just like y’all. We work long hours in grassroots organizations working to end imperialism, war, and gentrification; fighting to abolish the prison industrial complex; building power for workers and immigrants; and creating a world free from sexual violence. But big wins are few and far between. We are busting our tails building workers’ movements, but we’re burnt out by traditional union practices. We are in grassroots community struggles, in intense local fights, but feel disconnected from the broader movement because the day-to-day is just so consuming. Some of us organize for exciting non-profits and community organizations, but we know the revolution will not be funded. We are waiting tables, cleaning rooms, watching kids, and making stuff that somebody else is going to get rich off of, and having a hard time trying to win our co-workers over to fight against our bosses. We’re studying and teaching about really important stuff, but feel disconnected from the movements that feed us. We are young and Left and have babies to feed, partners and family members to support, loans to pay off, and these gas, food, and rent prices are killing us. We’re not going to “grow out of this” and do something “more responsible” than trying to change the world. We know that there’s an island of trash twice the size of Texas that’s floating in the Pacific Ocean, and wonder when, how, and how hard the ecological crisis is going to come down on us, our children, and the generations that will follow. We love Hip-Hop, punk rock, feminism, YouTube, and some of us even go to churches, temples, mosques, and quiet parks on peaceful mornings. We work and live here in the U.S. most of the time, but know that we are part of an international movement that is facing many of the same struggles. We all got here differently, but we share one conclusion: this system we’re in cannot be reformed…it’s got to go. This is a scary new world we’re in. The economic and political conditions around the world, as well as the state of people’s movements, are quite different than those that our elders faced. The ideas that we’re exchanging are constantly shifting; and the future looks a lot different from here than it did in the 60s, 70s, or 80s. Capitalism is shooting more steroids than the New York Yankees, and, despite inspiring and critical pockets of resistance to the Washington Consensus, neoliberalism is a force unlike any that people have ever faced. Well, that’s not entirely true. There are lots of little Lefts. There are collectives here, study groups there; small Left organizations scattered about; pockets of revolutionaries working in unions, community organizations, non-profits, and schools. We have much more in common politically than we differ on, but we don’t have a consistent venue for sharing, for strategizing, or working on projects together. Historically, that’s been the purpose of Left organization in the U.S. and across the globe: to pool the collective insights and resources of revolutionaries and build a fighting force. Identify and support new leadership from people’s movements. Study the problems, envision long-term solutions, and create a program to organize for the changes we need. In these organizations, everyone doesn’t have to be everything; cultural workers stand side by side with organizers and people who are talented administrators as everyone works to fill in each other’s gaps. Support and love each other. Coordinate and amplify. By creating a venue where revolutionaries can connect across diverse movements and geographies, the whole is greater than the sum of the parts. Revolutionary Voltron. But our generation is scared of many types of organizations, and rightfully so. We’ve heard the horror stories from our older comrades. A lot of these organizations marginalized people of color and claimed that feminism and queer liberation were separate from, and should be subordinated to, the class struggle. Brutal criticism/self-criticism and crippling struggles over positions and power. They’ve pushed folks aside, and broken a lot of hearts: there’s a lot of healing to do. Plenty of times, they’ve mimicked the worst of the dominant system and tragically eaten themselves up in orgies of hierarchy, competition, isolation, and violence. All centralism, no democracy. The state has exploited these weaknesses as they’ve wrought their deadly havoc. But we have to differentiate between babies and bathwater. After all, as ugly as these movement organizations got at times, this is the generation that spawned the Black Power, Chican@, Gay Liberation, and Women’s movements, among others. And we’re standing on their shoulders. Avoiding the lessons of a sometimes painful past doesn’t do these histories any justice. We’re supposed to learn from the mistakes and move forward, armed with knowledge, to generate new solutions. If the conclusion that we draw from these stories is avoidance, we’re missing the picture. The reality is: we need to be more connected. We need to be in regular dialogue about what’s going on in the world and how we can change it. We need to be sharing lessons and teaching one another. We need more strategy, more summing up and sharing, and more collective action. And now more than ever, as this period is ripe with contradictions for our political picking. The wars in Iraq and Afghanistan; the neoliberal transformation of New Orleans, the whole Gulf Coast, and every major city in the U.S.; the attacks on immigrants; mass incarceration and criminalization of African-Americans and other people of color; looming economic crisis and a price pinch that is killing all of us; climate change and ecological catastrophe: each of these issues could catalyze major moves. And they are. There are surges here, breakthroughs there-like the Social Forum and growing projects like Right to the City. Then there’s the Obama campaign and what it may or may not represent. But what is out there to connect all of us in a sustainable movement? Where can collective analysis and strategy come from? There is no place to regularly debate and make decisions together. How do we make sure that we’re headed in the same direction? The loose networks that we have right now just don’t facilitate that process. They are good for periodic bursts, but then recede as we go back to the daily grind of our local struggles. We need a mechanism to connect our fights and share analysis about what is working and what isn’t. We must use our limited resources and abundant technology to shrink the distances between East and West, North and South. In other words, we need organization. Without it, our vision will remain just that. Organization is key to making our vision a reality. There certainly are other components, but they are hard to develop AND sustain without organization and a means of bringing us together for collective action and struggle. We need theory, a program to match it, and the commitment and numbers to make it happen. Whether it’s Marx or Marcos; Ella Baker or Anne Braden; Malcolm, Mao, or Che: the people who have influenced us have always stressed the need for oppressed people and freedom fighters to have organizations. Our local struggles, social movement organizations, unions, and non-profits are not enough. If we don’t start connecting the bigger dots, and connecting with each other, we’re going to keep on struggling in vain. We work too hard to keep doing this. There’s too much at stake. So let’s take all of our mistrust for Left organizations, combine it with an ambitious hope for collective liberation, and talk about this together. Let’s talk about what we share and how we can work together. Let’s come up with 20-year dreams, 10-year plans, 5-year goals, and 1-year strategies. Let’s patiently rebuild what we’re all afraid of, but we all know is irreplaceable: organization. We’re proposing any and all of the following five steps as a place to start. Try something out, and hit us back so that we can really start to make this thing move. Together. 1. Study. All over the world, people have been struggling with this question for generations. What was wrong with the Soviet approach? What structures did the South Africans have? What happened in China, when millions all over the world had been inspired by their revolution? What about the Venezuelans? Palestinians? Cubans? Zapatistas? What’s working and what isn’t? What about the history of the Left here? Get together with folks that you believe in and do some research. 2. Make spaces at regional/national/international gatherings for conversations about organization. How do we stay connected with each other and move towards our goals collectively even if we’re spread out in social movement organizations, community organizations, unions, schools, non-profits, and revolutionary organizations? What kinds of formations can help us coordinate and amplify our local and issue-based work into a coherent, unified, approach towards total liberation? Many of you attended the “Building Revolutionary Strategy and Organization in the 21st Century” and “Another Politics is Possible” workshops at the US Social Forum or elsewhere to have these very conversations. Continue these conversations in your home towns. Then get together nationally just to generate vision and strategy. 3. Build a common project or campaign with folks who are in social movement organizations, community organizations, unions, schools, and revolutionary organizations. Base the project on local investigation of issues that folks can develop and work on together. We need more base-building, more mass movement. That’s how we create space for people to change their own realities. Revolutionaries, together, have a big role to play here. Doing this kind of work with those that we haven’t before will help to build trust and lasting political relationships that can take us to a higher-level of struggle. 4. Join an existing Left collective, organization, or network. We might recommend one if y’all asked (www.freedomroad.org, in case you’re interested). Find a group that has good ideas and good work on the ground, and get your feet wet. Are they organizing, or just talking? Do you respect the people involved? Is there room for change? Bring other organizers and activists with you and push these organizations to be better. Hell, join them, transform them, and change their directions. Utilize the resources and networks that exist to create the structures we’re going to need. 5. Start a new collective, organization, or network. But be careful, one of the failings of the previous Lefts is that they were too fractured, too disconnected, too many. If you’re starting something new, think about why. Do you need to build a new house, or can you find one that is structurally sound, move in, and make the changes that need to be made? If you have to build something new, how will you connect with allied organizations? Have this in mind before you begin. As young members of Freedom Road Socialist Organization/Organizacion Socialista del Camino para la Libertad, we believe that organization is absolutely necessary if we’re going to make these changes. We know that this is going to have to take new forms, and a variety of forms, but it has to happen soon. Think this over and get back to us. We’ve got some work to do together.